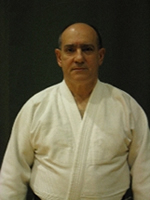 Mazza Sensei has had over 47 years experience in the study, practice and teaching of the martial way. He began his training in Korea in 1964 studying the art of Judo. Upon his return to the United States, he began his study of Oriental Philosophy and Meditation. Believing that, the only true path to self-understanding is through disciplined practice and the Martial Way, he immersed himself in the study and practice of various arts. Mazza Sensei has studied various styles of karate and Kung Fu. Feeling that there should be more to the Arts than kicking and punching, he embarked upon the study of Aikido. It was through this study that he gained a deep understanding of the Martial Way. At this time, he began the study of Zen and came to realize that all practice is truly one. The purpose of all training is the development of the individual. Mazza Sensei currently holds the rank of Rokudan in Aikido, issued by Aikido World H.Q. in Tokyo, Japan. Bina-Sensei is also a professor of Earth and planetary sciences at Northwestern University, a frequent visiting professor in Japan (where he can sometimes be found climbing to remote mountain retreats), and has long served as faculty advisor of the Northwestern Aikido Club, Zanshinkan Dojo. Mr. Bina began training in Aikido with Shihan Fumio Toyoda at Tenshinkan Dojo in Chicago in 1980. He later trained at the Jiyūgaoka Dojo of Shihan Hiroshi Tada in Tokyo, Japan, at the Shobukan Dojo of Shihan Mitsugi Saotome in Washington, D.C., and at the Kokikai Dojo of Shihan Shuji Maruyama in Princeton, New Jersey, while returning periodically to Chicago to continue training with Toyoda-Sensei, who awarded him the rank of nidan and the title of Fukushidoin. In recent years he has been an occasional visitor at the Fudoshin Dojo of Sensei Václav Kubát in Prague, Czech Republic (affiliated with Shihan Masatomi Ikeda). 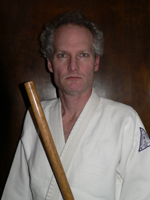 He continues to train under the supervision of Sensei John Mazza in Evanston, who promoted him to the rank of sandan.